Children's book on critical thinking teaches kids to say 'Show Me the Evidence' – AiPT! Adding a fourth R — rationality. When I was about 5 years old, I really thought my then 18-year-old brother was the most amazing person on the face of the planet. One day he said, “Hey Kendra, what’s that on your shirt?” When I looked down, he thumped me in the nose. I was a bit hurt, both physically and emotionally, but he pulled that trick (and a few others) time and time again. Eventually, it made me very wary and distrustful of my once dearly beloved bro. How was I supposed to know the difference between when he was being truthful and when he was being an a-hole? 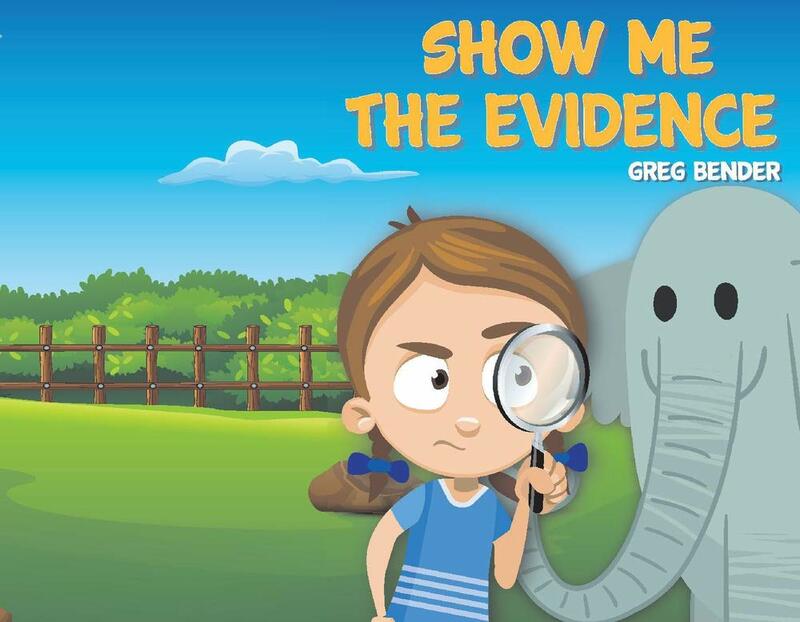 Show Me the Evidence by Greg Bender is designed to help kids figure out the answer. It’s seemingly geared for ages 4 to 6, but truthfully, we all know a few folks that could benefit from this book. Though plain and very short, it’s a useful story that addresses big ideas for little kids: using the scientific method. The story is super simple. Show Me the Evidence is centered around a girl named Nora. Her bully of a brother, Carson, is always playing mean pranks on her. He once told her there was a hair fairy that would give her gifts if she cut her hair and put it under her pillow. Another time he told her she would turn invisible if she ate broccoli, then pretended not to see her for days on end. Carson knows that Nora loves elephants, so one day he tells her there is an elephant outside. She rushes to the window and there isn’t anything to see. He tries to convince her that it’s only there when she blinks, and tells her that if he is foolin’, she can have his cookie. The doubt from all the previous pranks weigh on Nora’s mind, so she begins looking for clues. She doesn’t see footprints, there are no leaves missing from the tree it’s supposedly eating from, and she doesn’t smell elephant dookie. Her conclusion is that Carson better pay up with that cookie. He learns what the term evidence means and Nora figures out how to search for it. The story ends, just like that. Quick and simple. Afterward, there’s some information on the scientific method and a few graphics to show how to go from hypothesis to conclusion in a kid-friendly fashion. The book discusses the importance of finding evidence and may help even the youngest kids figure if they’re being duped and then, hopefully, prevent them for falling some for Grade-A Bologna in the future. The graphics are basic and they kind of resemble clipart. It looks like Show Me the Evidence was a PowerPoint presentation at one time in its life, maybe in the early 2000s. That said, younger kids probably won’t care. They may even enjoy it for its simple style and color usage. No, it isn’t an in-depth story and it isn’t full of excitement, but there is a lot to be gained from this book. It’s short enough to fit into the attention span of a small child. In the end, it isn’t about telling kids what to think, but providing them the tools to understand how to think. That’s really what makes Show Me the Evidence important. If you’re going to spend $5.00 on a morality-based book — say, about puppies digging holes and not getting dessert, or a rabbit that wants to become real — then take the time to think about what the messages are truly conveying. There’s nothing inherently wrong with spending large sums of cash on books about shiny fishes and caterpillars that eat cake. However, there’s really no reason to hold this book to a higher standard because it’s not like the ones I vaguely mentioned — cutesy, flashy, or “traditional”. Okay, so this book may seem a little cheesy, but you know what? Kids don’t mind cheesy because they’re still discovering the world. Show Me the Evidence does what it says on the label. It lovingly embraces critical thinking and breaks it down for young children. Isn’t that just as important for our kids as having books that help them count and read? After all, part of what makes children so adorably kind-hearted and innocent is their small understanding of the world and their massive lack of experience with people in general. This sweetness can also make them gullible and vulnerable to influence from those around them that don’t have the kids’ best interests in mind. The future is going to be much more difficult, cluttered with blatant misinformation and pseudoscience at every corner. We must begin investing in our kids and giving them the keys to unlock the skills that will help them grow to make good, informed choices in this world. For this reason, Greg Bender gets two thumbs up for his attempt to make the world a better, safer place for everyone. Show Me the Evidence is a great read for very young children and can be used as a tool help them begin the process of separating the good info from the garbage. This book is obviously for the youngest of readers, around ages 4 to 6. It's going to require some mild guidance, since it is a huge idea for a little mind to take in. "Show Me the Evidence" is short and sweet, to the point. Graphics kind of just meh, but the content is really what's important.